1. Metatarsus adductus. In metatarsus adductus, the forefoot is deviated medially and is slightly supinated. In the normal foot, a line drawn through the hindfoot will pass between the second and third toe. With metatarsus adductus, this line will pass lateral to the third toe. The prognosis is excellent, with most cases of metatarsus adductus resolving spontaneously. 2. Calcaneovalgus. Calcaneovalgus deformity of the foot is commonly associated with lateral tibial torsion. The forefoot is abducted, and the ankle is severely dorsiflexed to where the foot folds against the anterolateral surface of the tibia. The deformity is usually flexible, and the foot can be passively placed in the normal position. Calcaneovalgus deformity of the foot usually resolves spontaneously. 3. Talipes equinovarus. Talipes equinovarus, or club foot, has an incidence of approximately 1.5 in 1,000. Fifty percent of the time, the condition is bilateral. It can be associated with other conditions such as spina bifida and arthrogryposis. The foot turns inward and downward and remains tight in this position. Talipes equinovarus requires immediate evaluation since the timing of corrective casting, if necessary, can affect optimal outcome. “Chalk” patches. White areas of tympanosclerosis are common findings on examination of the ear drum. They are of little significance in themselves, and the hearing is often normal. apparent past otitis media. Extensive tympanosclerosis with a rigid drum is a sequela of past otitis media, and the ossicles, too, may be fixed or noncontinuous. Scarring of the drum. A gossamer-thin membrane can be seen to close this previously well-defined central perforation (arrow). examination with a pneumatic otoscope will show that this thin membrane moves and seals the defect, giving reassurance that the drum is intact. Scarring of the drum with retraction onto the round window, promontory, and incus is also evidence of past otitis media. microscope may be necessary to be certain of an intact drum. Scarred tympanic membrane. A scarred tympanic membrane in which the drum has become atelectatic and indrawn onto the long process of the incus and promontory. A retracted tympanic membrane which is thin and indrawn onto the long process of the incus (a), head of the stapes (b), promontary (c), and round window (d). The stapedius tendon is also seen in this panoramic view obtained with a fiberoptic endoscope. Onychomycosis is a common infection that can lead to potentially severe complications in patients who have impaired circulation, peripheral neuropathy, or are immunocompromised. This infection is particularly common in patients with diabetes, many of whom have one or more of these conditions. Onychomycosis treatment reduces risks, but is complicated by the potential for drug-drug interactions between systemic antifungals and the large number of medications often taken by these patients. Several topical therapies are available, including two newer agents that became available in 2014, increasing the potential for individualized treatment selection. The following case-based activity will test your ability to select appropriate therapies in patients with type 2 diabetes and onychomycosis, while bringing you up to date on risks and management of toenail infections in this vulnerable patient population. Albert is a 55-year-old man with type 2 diabetes who presents to your office with thickened, elongated, yellowed toenails (picture shown below). He reports that he first noticed the changes in his toenails about 3 months ago, at which time most of his nails were already involved. Albert was diagnosed with type 2 diabetes 4 years ago, and his blood sugar is currently poorly controlled on metformin alone. He has elevated triglyceride levels for which he is taking a low dose of simvastatin. He is clinically obese, which may have contributed to the fact that he did not notice his toenail infection until it was well entrenched. On clinical examination, you observe that all of Albert’s toenails are yellow in color and 6 have white lateral streaks. Two nails show involvement extending proximally to the lunula. Several nails, including both great toenails, show subungual hyperkeratosis that is greater than 2 mm thick and two are onycholytic. You estimate that at least 75% of the overall area of Albert’s toenails is infected, with involvement seen in all 10 toenails. Which of the following clinical characteristics is a risk factor for onychomycosis in patients with diabetes? Discussion: Patients with diabetes can develop peripheral neuropathy, which contributes to the risk of developing onychomycosis, perhaps because this condition impedes proper foot care and allows unrecognized trauma to the nail. Men with diabetes are approximately 3 times more likely to develop onychomycosis compared with women with diabetes, and the prevalence of onychomycosis increases with age. Onychomycosis does not seem to be linked to the presence or absence of renal dysfunction in patients with diabetes. Onychomycosis is highly prevalent in patients with diabetes. A North American study of 550 consecutive patients with diabetes found abnormal-appearing toenails in 46% of patients and mycological evidence of onychomycosis in 26% of patients. After adjusting for age, the researchers calculated a 34.9% prevalence in the overall US diabetes population, an estimate that is similar in other studies. Onychomycosis was 2.77 times more likely in patients with diabetes compared with individuals without diabetes. Prevalence in the one-third of patients with type 1 diabetes in this study was lower but still elevated compared with individuals without diabetes, with an odds ratio of 1.69. Onychomycosis was also 3 times more likely in men compared with women with diabetes. The X ray shown below is of an asymptomatic person. Chilaiditi described this normal variant in 1911 where the transverse colon is interposed between the right hemidiaphragm and the liver. Its prevalence is thought to be 0.025%. Occasional reports describe patients with Chilaiditi’s syndrome where patients complain of intermittent abdominal pain requiring laparotomy to rule out other causes of peritonism, e.g. perforated ulcer, ruptured appendix. • P wave: Absent (P may be replaced by fibrillary f wave). • Rhythm: Irregularly irregular (R-R interval is irregular). (Atrial rate is very high and ventricular rate is less). • Fast atrial fibrillation: Heart rate >100 beats/min. • Slow atrial fibrillation: Heart rate <100 beats/min. Ans. It is an arrhythmia where atria beat rapidly, chaotically and ineffectively, while the ventricles respond at irregular intervals, producing the characteristic irregularly irregular pulse. Any conditions causing raised atrial pressure, increased atrial muscle mass, atrial fibrosis, inflammation and infiltration of the atrium can cause atrial fibrillation. Q. What are the types of atrial fibrillation? • Paroxysmal: Discrete self-limiting episodes. May be persistent if underlying disease progresses. • Persistent: Prolonged episode that can be terminated by electrical or chemical cardioversion. • Permanent: Sinus rhythm cannot be restored. Pathophysiology: When skin is injured, fibrous tissue, called scar tissue, forms over the wound to repair and protect the injury. In some cases, scar tissue grows excessively, forming smooth, hard growths called keloids. Keloids can be much larger than the original wound. A 26-year-old man is seen for an upper respiratory infection. 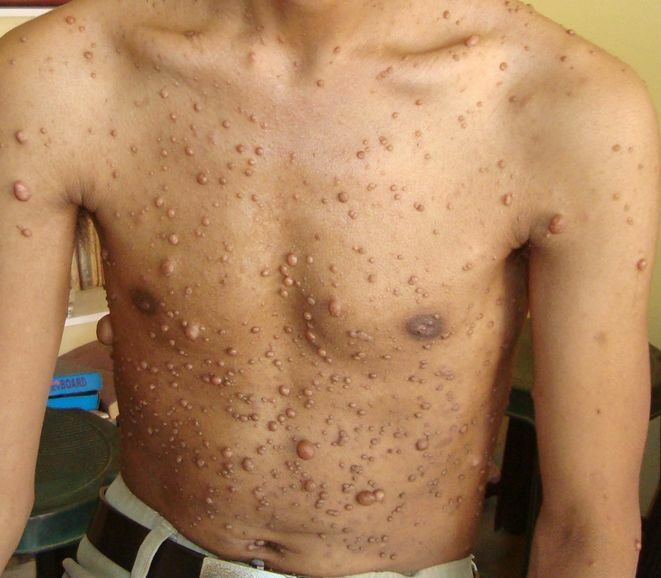 After removing his shirt, you notice the lesions shown in the picture below. He reports that his father has similar lesions. • Aberrant ventricular conduction, usually with RBBB pattern. 1. After depolarization, tissue repolarizes during its refractory period. Refractory period changes with the preceding cardiac cycle, with longer R-R intervals producing longer refractory periods and shorter R-R intervals producing shorter refractory periods. 2. A longer R-R interval lengthens the following refractory period. When an early or premature (ectopic) depolarization reaches the ventricular conduction system before it has completely repolarized, aberrant conduction may occur and be manifest on the ECG with a bundle branch block (BBB) pattern. 3. Ashman phenomenon most commonly appears with an RBBB pattern, since the right bundle has a longer refractory period than the left bundle. 4. Ashman phenomenon is often seen in atrial fibrillation, when a long R-R interval is followed by a much shorter R-R interval. superimposition or summations of shadows the individual deposits are identifiable and measure about a 1 mm in diameter thick and streaky. The opacity appears confluent showing the lungs as almost white with obliteration of the mediastinal and diaphragmatic contours and pulmonary vascular marking are indistinct. The density is greater over the lower than the upper zone. Comments and Explanation: The characteristic finding on the chest radiograph is that of a fine, dense stippling. This is a well-defined, nodular infiltrate which involves both lungs, and may be so extensive as to cause opaque lungs with relative lucency of the mediastinal structures, diaphragm and pleura. There is widespread parenchymal calcification. In addition to the finding seen, other findings that may be seen include bullae in the lung apices, a zone of increased lucency between lung parenchyma and the ribs (a black pleural line) and pleural calcification. In some patients concentration of the nodules in subpleural, para septal and peribronchiolar alveoli can produce linear strands of calcification parallel to or perpendicular to the pleural surface. Bullous myringitis is a direct inflammation and infection of the tympanic membrane secondary to a viral or bacterial agent. Vesicles or bullae filled with blood or serosanguinous fluid on an erythematous tympanic membrane are the hallmarks. Frequently, a concomitant otitis media with effusion is noted. Typical pathogens are the same as seen in Acute otitis media. Clinical Presentation: The onset of bullous myringitis is preceded by an upper respiratory tract infection and is heralded by sudden onset of severe ear pain, scant serosanguinous drainage from the ear canal, and frequently some degree of hearing loss. Otoscopy reveals bullae on either the inner or outer surface of the tympanic membrane. Bullous Myringitis. A large fluid-filled bulla is seen distorting the surface of the tympanic membrane. Patients presenting with fever, hearing loss, and purulent drainage are more likely to have concomitant infections, such as Otitis media and otitis externa . Management: Differentiation between viral and bacterial etiologies for tympanic membrane bullae is not necessary. Although most episodes resolve spontaneously, many physicians prescribe antibiotics. Warm compresses, topical or strong analgesics, and oral decongestants provide symptomatic relief. Referral is not necessary in most cases unless rupture of the bullae is required for pain relief. Eczema of the meatus and pinna (see picture below) may be associated with eczema elsewhere, particularly in the scalp, or it may be an isolated condition affecting only one ear. Itching is the main symptom, with scanty discharge. suction and the Zeiss microscope. Otitis externa tends to recur. A furuncle in the meatus is the other common type of otitis externa. It is characterized by pain; pain on movement of the pinna or on inserting the auriscope is diagnostic of a furuncle. Diabetes mellitus must be excluded with recurrent furuncles. A 65-year-old male presented with cardiogenic shock. He had an emergency CABG (Coronary artery bypass grafting) which was associated with a very stormy peri-operative period. His CXR (shown in picture below) was taken upon arrival at the Intensive Care Unit (ICU). What is the most significant abnormality? The CXR shows an opaque density in the region of the right lower zone. Each lung field on an erect CXR is divided into three zones. The upper zone is an area which lies above a horizontal line drawn from the medial end of the second rib anteriorly. The middle zone lies below this and is bordered inferiorly by a line drawn similarly from the fourth rib. The lower zone lies below this. • P - Tall, > 2.5 mm (> 2.5 small squares), better seen in LII, LIII, aVF and sometimes in V1 . (Tall P is called P pulmonale). • P in V1 - Biphasic, tall initial positive deflection (> 1.5 mm) with a small negative deflection (only positive deflection may be present). Q. What does P pulmonale indicate? Ans. It indicates right atrial hypertrophy or enlargement. (It is called P pulmonale, because it is commonly seen in severe pulmonary disease). Q. What are the causes of P pulmonale? Geographic tongue is a benign, chronic condition of unknown cause. It is present in around 13% of the population and is more common in females. As the name suggests in this condition there is a map-like appearance on the upper surface and sides of the tongue. It may occur in other areas of the mouth, as well. Although geographic tongue may look alarming, it doesn't cause health problems and isn't associated with infection or cancer. 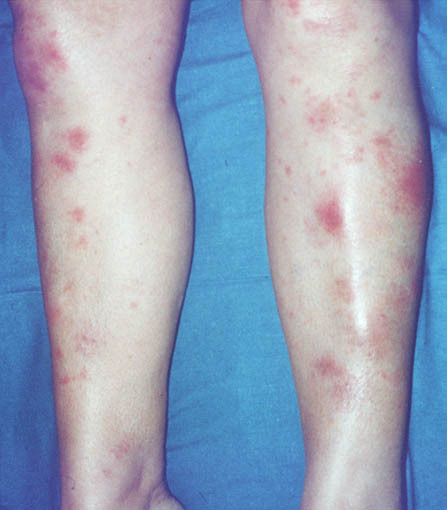 Erythematous areas with a white grey border (the irregular, smooth red areas are said to look like the outline of a map). The patches may vary in size, shape, and color. Some patients report burning after eating certain food. This ECG was recorded from a 60-year-old woman with rheumatic heart disease. She had been in heart failure, but this had been treated and she was no longer breathless. What does the ECG show and what question might you ask her? ventricular rate seems well-controlled. The prominent U waves in lead V2 could indicate hypokalaemia. An 18-year-old woman presents to your office complaining of tender nodules that have developed on the lower extremities. She has no other symptoms. She continues with her oral contraceptives but has not started any new medications. She denies any fevers and has no history of recent trauma. • QRS complex widening to 90 to 120 ms.
• Right axis deviation must be beyond 100 degrees and must have no other cause (such as lateral myocardial infarction). • Small R wave and large S wave in the high lateral leads, I and aVL. • Slurred S wave in V5 and V6. • This example also contains unrelated ST changes. due to the blocked left posterior fascicle. Therefore, the latter portion of the QRS depolarizes toward the inferior myocardium, manifesting as strong right axis deviation. Any trauma to the eye that disrupts the normal architecture of the lens may result in the development of a traumatic cataract—a lens opacity. The mechanism behind cataract formation involves fluid infiltration into the normally avascular and acellular lens stroma. The lens may be observed to swell with fluid and become cloudy and opacified. The time course is usually weeks to months following the original insult. Cataracts that are large enough may be observed by the naked eye. Those that are within the central visual field may cause blurring of vision or distortion of light around objects (eg, halos). 1. Traumatic cataracts are frequent sequelae of lightning injury. Advise all victims of lightning strike of this possibility. 2. Cataracts may also occur as a result of electric current injury to the vicinity of the cranial vault. 3. Leukocoria results from a dense cataract, which causes loss of the red reflex. 4. If a cataract develops sufficient size and “swells” the lens, the trabecular meshwork may become blocked, producing glaucoma. The cavity has an indentation at the fundus. This is probably the mildest form of uterine abnormality. The uterus appears normal externally, but the cavity has a septum. An elderly male presents with a history of exertional dyspnea, orthopnea, and paroxysmal nocturnal dyspnea. Discussion: The Chest X Ray shows classic evidence of left ventricular failure, i.e. Kerley B lines (which indicate distension of lymphatics). In addition, there is evidence of sternotomy wires, suggesting previous coronary artery bypass surgery (CABG). Followup Of this Patient: Following diuresis, the pulmonary infiltrates have cleared . (X ray shown below). Tall R wave in V1 > 7 mm (also deep S in V5 or V6). • R/S ratio in V1 > 1 (R is > S in V1). • R in V1 + S in V5 or V6 is equal to or > 10.5 mm. • R in aVR > 5 mm. • S in V1 < 2 mm. • Incomplete RBBB (rSR in V1). • Small q in V1. • Right axis deviation (between + 90° and + 180°). • Mitral stenosis with pulmonary hypertension. • Pulmonary hypertension (due to any cause). Erythema ab igne (EAI, also known toasted skin syndrome) is a skin condition caused by over exposure to infrared radiations. 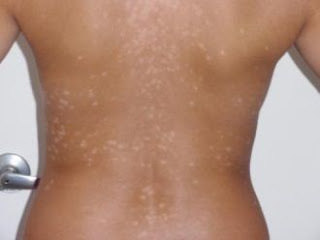 Initially, the skin in erythema ab igne patients is often mildly erythematous; however, after repeated heat exposures, the classic blue, purple, or brown reticulated hyperpigmentation develops. A history of prolonged or repeated skin exposure to mild-to-moderate heat or infrared radiation that is below the threshold of thermal burn (less than 45°C) should raise suspicion. The duration of exposure varies from weeks to years. Direct exposure to the optic drive, battery, or ventilation fan of computers. Resting a laptop computer on the thigh (laptop computer-induced erythema ab igne). Repeated exposure to heated car seats, space heaters, or fireplaces. Repeated or prolonged exposure to a heater is a common cause of this condition in elderly individuals. Erythema ab igne (EAI) is generally localized and usually well-demarcated, presenting with a reticulated macular pattern of erythema and hyperpigmentation . Cutaneous lesions are commonly asymptomatic, although patients may complain of pruritus or a slight burning sensation. A 50-year-old man is seen in the Emergency department with severe central chest pain which he says is present for about 18 hours. What does this ECG show and how would you manage this patient? Tinea versicolor is a common skin infection caused by the organism Pityrosporum orbiculare (also known as Malassezia furfur, Pityrosporum ovale, or Malassezia ovalis). The condition usually affects adolescents and young adults in tropical environments. The organism is a yeast that is a constituent of the normal skin flora. 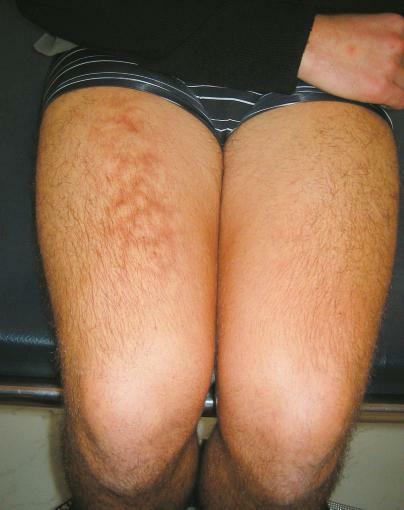 Clinical features: Tinea versicolor usually responds to medical therapy, but recurrence is common, and long-term preventative treatment may be necessary. Versicolor refers to the variety and changing shades of colors present in this condition. 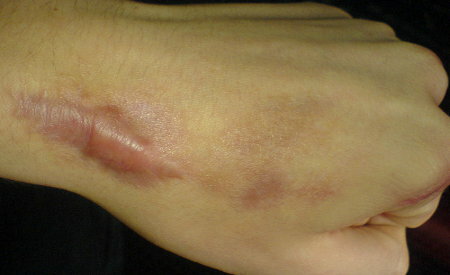 Lesions can be hypopigmented, light brown, or salmon-colored macules. A fine scale is often noted, especially after scraping. Individual lesions are typically small, but frequently coalesce to form larger lesions. Typically the lesions are limited to the outer skin, most commonly on the upper trunk and extremities, and are less common on the face and intertriginous areas. Most patients are asymptomatic; however, some may complain of mild pruritus. Left anterior fascicular block (LAFB), also known as left anterior hemiblock is an abnormal condition of the left ventricle of the heart, related to, but distinguished from, left bundle branch block (LBBB). It is caused by only the anterior half of the left bundle branch being defective. It is manifested on the ECG by left axis deviation. depolarizes toward the upper lateral myocardium, manifested as strong left axis deviation. The x ray shown in the picture above is of a 60 year old man who presented with a history of cough that was not responding to antibiotics and cough syrups. X Ray Description: X-ray chest shows a mass lesion measuring 6 cm in diameter in left lower zone of which the margins are not smooth, finding suggestive of carcinoma lung, however, needs confirmation on CT chest. enhancing irregular mass lesion measuring 5 × 6 cm in the superior segment of Left lower lobe and lingula. Feeding vessel is also seen. Multiple areas of necrosis are seen within. There is central cavitation and air fluid level. Surrounding lung shows infiltration. Multiple pretracheal, carinal, and subcarinal lymph nodes are seen measuring 11–17 mm. Lens dislocation may result from blunt trauma to the globe. As the anterior surface of the eye is struck, there is compression in the anteroposterior dimension with resultant stretching of the globe along its equator in the medial-lateral plane. As this occurs, it stretches the zonule fibers, which suspend the lens in place, and they along with the lens capsule may become disrupted. Lens Dislocation. Lens dislocation revealed during slit-lamp examination. Note the zonule fibers, which normally hold the lens in place. on the severity of the injury. Occasionally there can be dramatic visual fluctuations caused by the lens changing position with resultant phakic and aphakic vision. There is generally a lack of pain except if secondary angle closure glaucoma occurs from the lens causing pupillary block.